Cooking meals for the family will always be my favorite thing to do. Nothing makes my heart fuzzy than seeing the anticipation in my kids’ faces. So it is ultimately heartbreaking to see their faces fall whenever I cook them pasta ravioli with badly grated Parmesan cheese or factory grated cheese. Knowing this, I knew it’s time to do something. Thank the heavens for rotary cheese grater, a type of cheese grater whose primary purpose is to have an efficient grating process. There is a toothed drum blade which you rotate or turn while the cheese housed inside and, well, there you go. Here are my top picks. The reason why I recommend the NSF Restaurant Certified more is that it comes with more beneficial design features unlike the original classic one and it comes with the same price point. And since this product is NSF Restaurant Certified, this product is designed to meet the standards that fit and match that of the public health. One of the design features I love about this is that you can alternate between use for left hand and for right hand. It is also easy to be taken apart, perfect for cleaning. 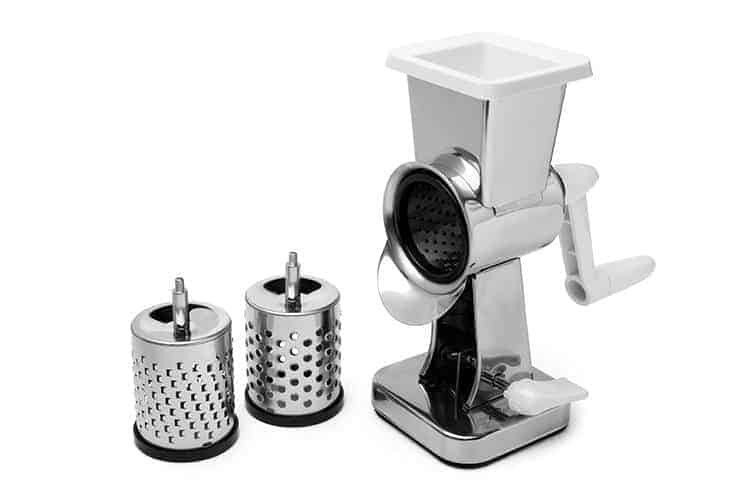 This rotary cheese grater is one of my top picks for it comes with two interchangeable drums which give me a variety of options. I can use this, not just for cheese but also for sweet potatoes, hash brown and many others. It is very easy to assemble and dismantle, as well which makes it easier for me to clean it. The one thing I did not like about this is that its suction cup does not attach well to my countertop. This rotary cheese grater is multipurpose which I absolutely love. I can use it for hard cheese types like parmesan, for the soft cheese types such as cheddar, and also for chocolates nuts and almonds. It is so versatile that it immediately became one of my top picks. It is also very easy to clean because it is not just dishwasher safe, but its three parts are also easily removable. However, the one thing I definitely not like about this is it seems fragile. Whenever I use it, it feels like it is gonna break soon. 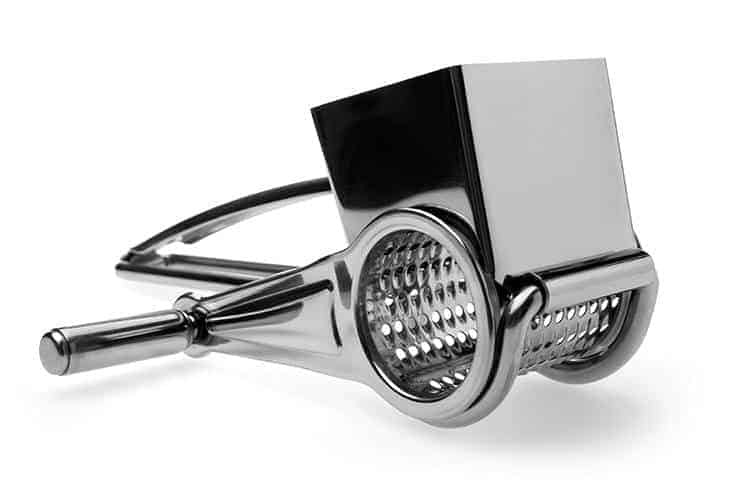 The LOVKITCHEN Rotary Cheese Grater is also one of my faves for many reasons. The number one reason is that it comes with three types of cylinder drums which is just absolutely perfect because I always cook meals that require different types of cheese from each other. And since this product is also a Grade A stainless steel, it is durable enough. I guess, one thing I did not like about this is that it has a wide gap in the front part. I love this German engineered kitchenware for many things. As a self-professed kitchen geek, I love prepping for many types of food. And that include many types of grated cheese. 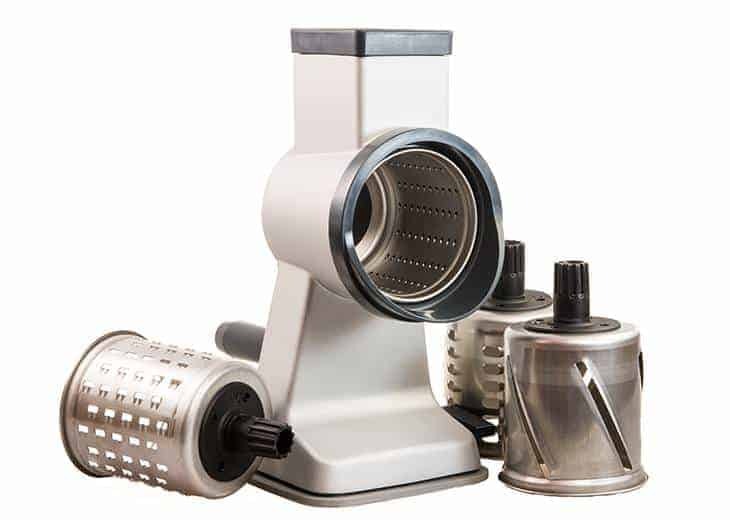 The Westmark Rotary Cheese Grater comes with a set of three drums which I can use for medium grating, for fine grating, and for grating vegetables. Second thing I love about this is the fact that it is stainless steel so I wouldn’t have to worry about stains and all. And third, cleaning is not that much of a struggle since it is dishwasher safe. However, the thing I did not like about this is how it fragile it feels in my hands. Since the arm is plastic, it feels like it is going to break or snap any second. Because of this, I do try not to put that much pressure when I am using it. 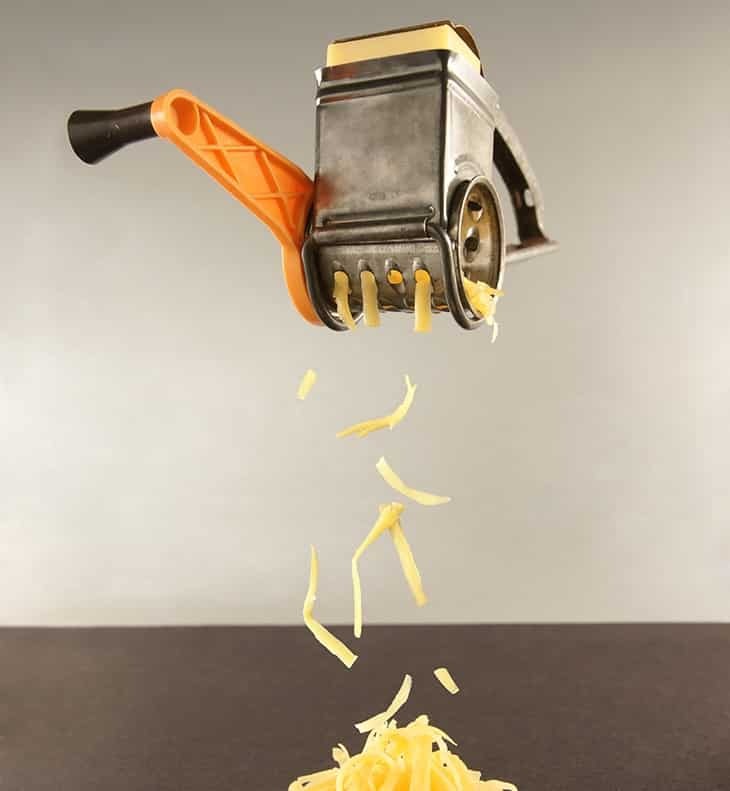 While this may seem like a no-brainer, there are actual rotary cheese graters that do not have sharp enough teeth. You are going to have to look for razor sharp blades, otherwise, the quality of your cheese will just be chunky, gooey and just naturally bad. You do not have to worry about accidentally hurting or cutting yourself because unlike what usually happens with standard graters, rotary cheese graters provide a safe environment in which you can use sharp-toothed blades without the possibility of cutting yourself. In addition, you might also want to consider purchasing rotary cheese graters with more than one drum. This will benefit you best if you are the type of who want variety when it comes to cheese types. Generally, on one hand, those drums that have little holes are the ones you use for the hard cheese types for they will provide you with very fine grate. On the other hand, those with large holes are the ones you use to shred the soft cheese types. They make for good spaghetti toppings. There are like two types of person in this world. There are the ones who only use cheese as some sort of embellishment or garnish. And of course, probably the majority are the ones who need large sizes of evenly and finely measures cheese. If you belong to the latter, then you are going to need rotary cheese grater equipped with large hoppers. If you do not know, do a quick evaluation. Do you typically organize dinner parties? Do you love prepping complicated and complex dishes? If the answer is yes, then you belong to the majority. 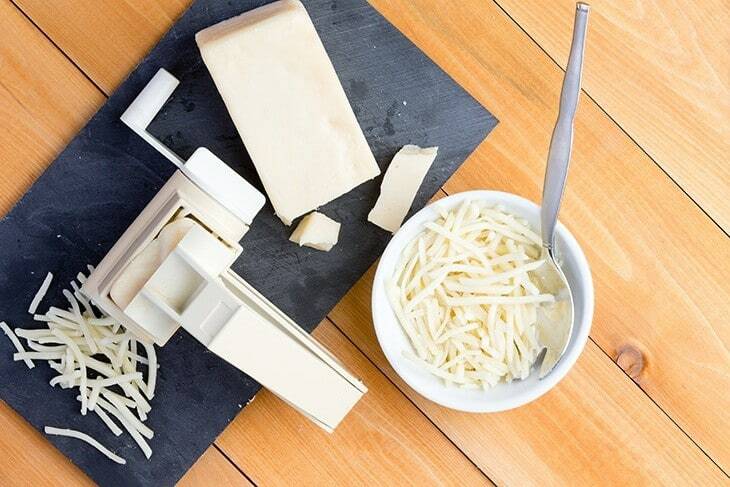 Buying a rotary cheese grater with large hoppers makes it easy for you produce evenly measured and big quantities of cheese with minimal to no effort. 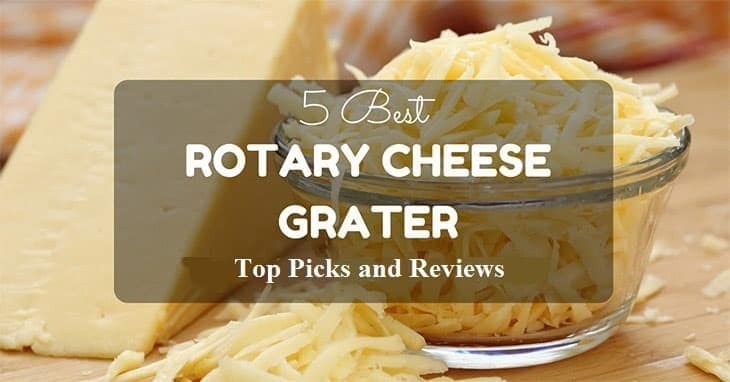 In addition, if you do not want to spend the next hour just grating cheese which of course you do not, you have to look for a rotary cheese grater that is at least two inches in size. It does not just make the process much quicker but also stops you from the possibility of whisking through your cheese or accidentally chopping them down. Just as we put importance into our hygiene, so must we when it comes to equipments we use in our kitchens. Most rotary cheese graters tend to be too small for you to be able to handwash them. Moreover, they have to be at least rust proof. Since cleaning and sterilizing them can be a struggle, this feature will certainly help to keep the equipment clean and protected from bacteria. Rotary cheese graters belong to the category of kitchen equipments that come with an in-house feature in which you will have to put food inside such as food blenders. And since we were just on the topic of cleaning, let me just emphasize that a rotary cheese grater’s ability to be dismantled is also vital to keep it clean and sterilized. Since food can be stuck inside the grater, you got to make sure it is kept clean. And the only way you can do this if you take them apart. There are products that come with a cleaning brush designed to help you keep food remnants away from the drum. Moreover, the drums also need to have this feature. Make sure there are no things like screws that could get lost along the way. Personally, this is one thing I hate. I tend to be clumsy sometimes and I hate it when just few weeks in and I already lost a couple of pins. The obvious edge of rotary cheese grater is that unlike standard flat graters, it does not require you that much effort. With rotary cheese graters, the only thing you have to do is to place the cheese inside the drum and twist and turn the handle and voila, there you go, your finely measured cheese. However, you must also keep in mind that the handle should not require superman strength or too much force to be able to turn. Some products may be a little difficult to rotate. For this reason, make sure the turning of the hopper is smooth enough. And the verdict is, the winner for this roundup will be Zyliss Classic Rotary Cheese Grater. One of the main reasons is because this one is NSF Restaurant Certified. Since it is used by many restaurants, it is designed to match and meet the standards that will satisfy the general public. Moreover, its size is small enough to be easily stored but it does not feel fragile or flimsy. It is also very easy to clean since it can be easily disassembled and assembled. So there you have it, guys! 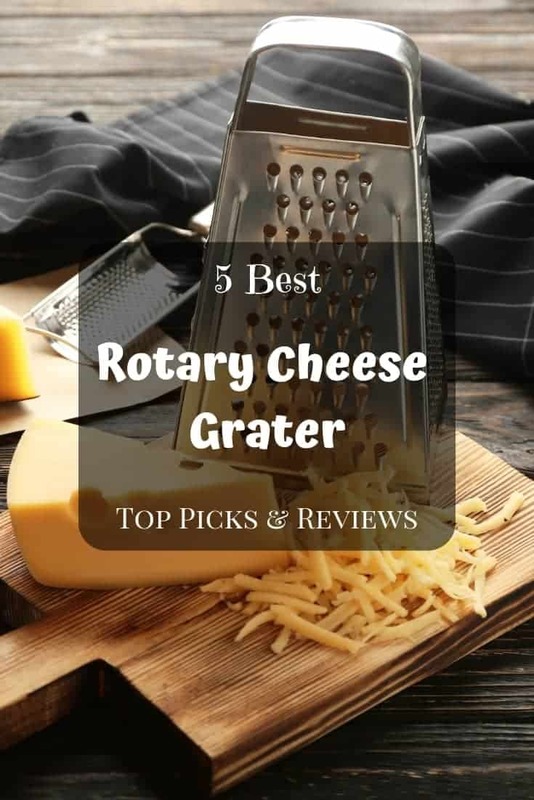 I hope this article really helped you on your journey to finding the best rotary cheese grater for you! If you have any more questions, suggestions or just recommendations, do not hesitate to leave them down below!